Here at Rye Health Store we find that dairy alternatives are very popular with our customers. There is a big trend towards veganism, especially among the younger generation. A lot of teenagers are switching to a plant-based diet. We have also found that a lot of our customers are either reducing or eliminating dairy because they have an intolerance to milk. Others are making the switch for health reasons, such as eczema, psoriasis or inflammatory joint conditions, all of which can benefit from cutting out dairy in the diet. We used to find that rice milk was very popular but in recent times this has been replaced with almond milk, which is now very much in demand with our customers. Almond milk is a good all-round replacement for cow’s milk and can be used in hot drinks and smoothies as well as adding to cereals and for making sauces. It is available in sweetened and non-sweetened varieties. I would say that our second most popular milk is oat milk, particularly the barista edition which you can foam to make cappuccinos. Many people blend either almond or oat milk with raw cacao to make a healthy dairy-free hot chocolate. Hemp milk is becoming more popular. It has lots of health benefits because it’s a rich source of omega-3 essential fatty acids. Coconut milk is gaining popularity, as are the other nut milks such as hazelnut and cashew. There are so many varieties on the market now that customers can experiment and find out which one works best for them. Soya milk is still favoured by our customers, as are soya yogurts. In fact we have regulars who buy crates of these from us. Our second most popular yogurt is coconut and we also stock a coconut kefir which is also well liked. Not only is it dairy-free, but it is a probiotic drink, so it is good for supporting the gut flora. Sheep’s and goat’s yogurts are available too for those who are not necessarily vegan but wanting to avoid cow’s dairy. We have found that the variety of dairy-free cheeses now available has expanded greatly in recent years. These are particularly popular with vegan shoppers. Vegan cheese tends to be made from coconut, almonds and cashew nuts, and is often fermented in the same way as conventional cheese. Vegan cheeses now come in different flavours and types, so you can choose mozzarella to go on your pizza or blue cheese to add to your salad. With all the alternatives on the market now it is easier than ever before for anyone wishing to reduce or cut out dairy from their diet. And remember, if you need any guidance or advice on dairy alternatives you can always ask for help in your local independent health store. 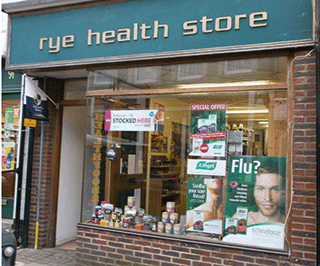 Rye Health Store is based at 90 High Street, Rye, in East Sussex. The store has been in existence for over 30 years and has a very loyal customer base. Previous owner, Nick Crawshaw, retired in February this year and herbalist and naturopath Georgina Woods subsequently took over the reins. The store stocks a wide range of health foods; vitamins, minerals and supplements; as well as natural bodycare products.